Lily: "MOM! 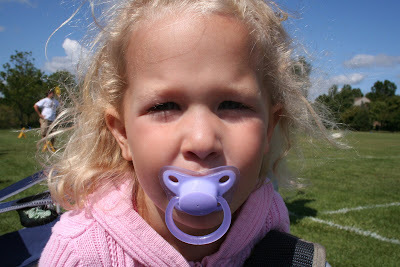 I lost my nuk!" (begins ticking off on fingers...with attitude): "I had my nuk on Monday. I had my nuk on Tuesday. I had my nuk on Wednesday. I had my nuk on Friday." Me: "Wait! Didn't you have your nuk on Thursday? You forgot to say Thursday." Lily: "That's where I lost it!"